Having such a program could further strain relations with the U.S., the kingdom’s longtime security partner, at a time when ties already are being tested by the killing of Washington Post columnist Jamal Khashoggi and the Saudi-led war in Yemen. 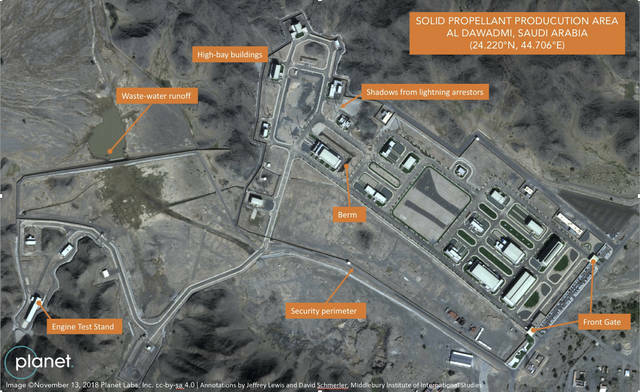 The images, first reported by The Washington Post, focus on a military base near the town of al-Dawadmi, some 230 kilometers (145 miles) west of Riyadh, the Saudi capital. Jane’s Defence Weekly first identified the base in 2013, suggesting its two launch pads appear oriented to target Israel and Iran with ballistic missiles the kingdom previously bought from China. Asked by The Associated Press on Friday about the base, China’s Defense Ministry declined immediately to comment. “I have never heard of such a thing as China helping Saudi Arabia to build a missile base,” Chinese Foreign Ministry spokeswoman Hua Chunying said. Saudi Arabia, along with Israel and the United States, have long criticized Iran’s ballistic missile program, viewing it as a regional threat. 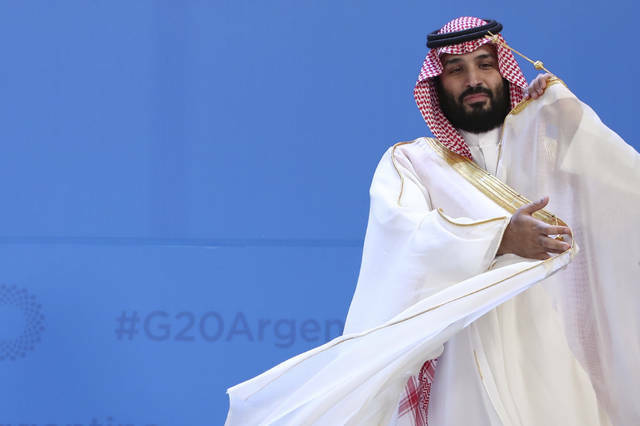 “Saudi Arabia does not want to acquire any nuclear bomb, but without a doubt if Iran developed a nuclear bomb, we will follow suit as soon as possible,” Prince Mohammed told CBS’ “60 Minutes” in an interview aired last March. 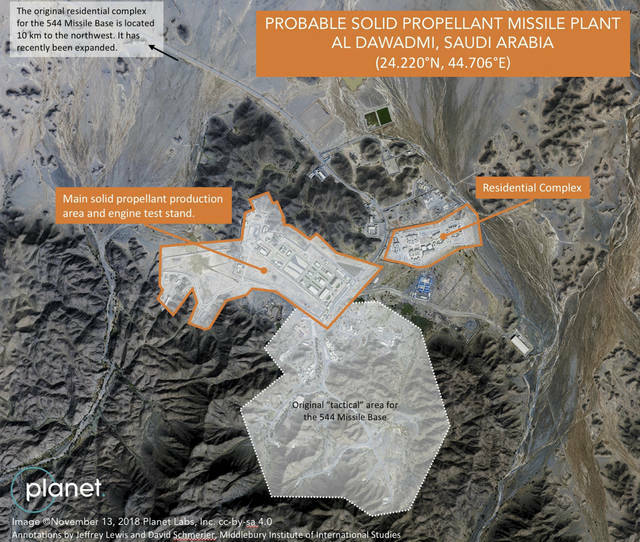 A Saudi program would only complicate efforts by the U.S. and its Western allies to limit Iran’s ballistic missile program, said STRATFOR, the Austin, Texas-based private intelligence firm. STRATFOR said that “should Saudi Arabia move into a test-launch phase, the United States will be pressured to take action with sanctions,” as it has done with Iran. Congress has grown increasingly critical of Saudi Arabia since the Oct. 2 assassination of Khashoggi at the Saudi Consulate in Istanbul, allegedly carried out by members of Prince Mohammed’s entourage. The kingdom’s yearslong war in Yemen also has angered lawmakers. BRUMADINHO, Brazil (AP) — Brazilian officials on Sunday suspended the search for potential survivors of a dam collapse that has killed at least 40 people amid fears that another nearby dam owned by the same company was also at risk of breaching. Authorities were evacuating several neighborhoods in the southeastern city of Brumadinho that were within range of the B6 dam owned by the Brazilian mining company Vale. There was no immediate word on how many people were evacuated. The firefighters had been working to extract a cow found alive in the mud, but they pulled back on the order of police, leaving the animal. While the ground search was stopped, helicopters continued to fly over the area, possibly so they would not be hit if another collapse happened. Even before the latest setbacks, hope that loved ones had survived a tsunami of iron ore mine waste from Friday’s dam collapse in the area was turning to anguish and anger over the increasing likelihood that many of the hundreds of people missing had died. Company employees at the mining complex were eating lunch Friday afternoon when the first dam gave way. By Saturday night, when authorities called off rescue efforts until daybreak, the dam break toll stood at 40 dead with up to 300 people estimated to be missing. All day Saturday, helicopters flew low over areas encased by a river of mud and mining waste as firefighters dug frantically to get into buried structures. In addition to the 40 bodies recovered as of Saturday night, 23 people were hospitalized, according to the Minas Gerais fire department. There had been some signs of hope earlier Saturday when authorities found 43 more people alive. The company said Saturday that while 100 workers were accounted for, more than 200 workers were still missing. Fire officials at one point estimated the total number at close to 300. Vale CEO Fabio Schvartsman said he did not know what caused the collapse. Brazil’s Attorney General Raquel Dodge promised to investigate the mining dam collapse, saying “someone is definitely at fault.” Dodge noted there are 600 mines in the state of Minas Gerais alone that are classified as being at risk of rupture. Marina Silva, a former environmental minister and presidential candidate, toured the area on Sunday. She said such tragedies should be deemed “heinous crimes,” and that Congress should bear part of the blame for not toughening regulations and enforcement. MANILA, Philippines (AP) — President Rodrigo Duterte and his top security officials on Monday visited a Catholic cathedral in the southern Philippines where suspected Islamic militants set off bombs that killed at least 20 people and wounded more than 100.